I don't do much heavy decorating for fall. I try to bring in more layers, add things with texture, and use accessories with a darker palette, but I don't feel it's really necessary to buy lots more stuff just to get that fall feeling. A quick way to add instant cozy is just to change out your summery stripe and cotton cushion covers for ones in velvet, wool, and heavier canvas. 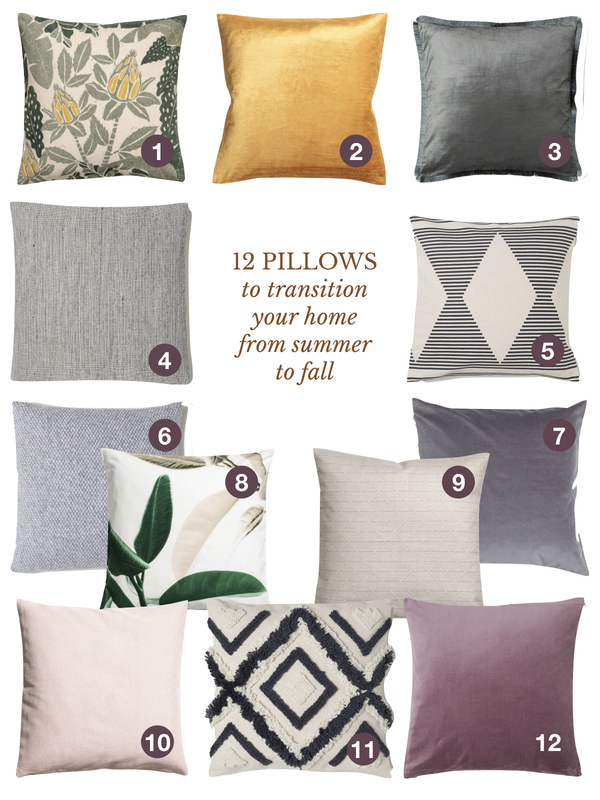 I was just shopping the H&M Home sales (this pillow came home with me) and spotted these lovelies that are the perfect way to transition your home from summer to fall. By the looks of it, I'm really feeling grey-green, taupes and plum colours for fall. How about you... have you given a thought to fall decorating? Or is too hot where you are to think about anything but summer? ?